Amazing resort surrounded by a jungle, the resort has an outstanding pool with real nature atmosphere. Hanging Gardens Ubud is a luxury hotel built on 3.2 hectares of land situated near Payangan, a village North of Ubud, surrounded by ancient trees, steep terraced gardens and jungle forest, but the site was once a barren, 45-degree angled hillside. Now a hotel perched adjacent to layered rice terraces with sweeping views across the Ayung River gorge to the ancient Pura Penataran Dalem Segara temple, Hanging Gardens Ubud’s 38 villas are all constructed in contemporary Balinese style on gravity-defying wooden pillars with thatched alang-alang roofs. The entrepreneurial pioneer owners conceived Hanging Gardens Ubud in 2003 and the building work was completed in 2005. The concept was to create something magical and authentic in the heart of the Balinese jungle; a place to escape the frenetic beach resorts and party lifestyle and literally kick back and relax amongst the beautiful and natural tropical environment. Their hidden paradise was founded near the Buahan village community, close to Payangan, 20 minutes North of Ubud, Bali’s spiritual heart. This little village with a population of 1300 had all of the spiritual and cultural richness of Ubud but was yet undiscovered by tourism. Here the designers decided to lay down the roots of their personal spiritual nirvana. The owners wanted to create an estate that took its inspiration from the surrounding countryside, a sanctuary inspired by nature that would be built harmoniously into the landscape leaving as small a footprint as possible. The aim was to protect and reflect the environments and to propagate and preserve local traditions and indigenous style. In building the expansive property, the designers were proud that only one tree needed to be moved. Over 700 local craftsmen lovingly built Hanging Gardens Ubud, sourcing traditional materials, utilising existing resources and adapting indigenous ideas. The owners employed a local architect who transcribed their vision into a practical design. The design of the hotel follows the contours of the land – the idea was to work as much with the natural habitat as possible. The surrounding treetops serve as an umbrella for the open walkways and the wind as natural ventilation providing a constant breeze through the open restaurants and common areas. The intention was to incorporate vegetation into the villa resort, thus planting palm trees, bamboo and other plants. An abundance of bamboo was used in the building of the hotel, not just for construction and scaffolding but also planted in the landscape as shade protection from the sun. Traditional belief holds that being in a bamboo grove – the favourite dwelling place of Buddha – restores emotional calm and stimulates creativity. The foundations built deep into the landscape were dug three times further down than the original plan to ensure stability against the tropical rainstorms that could lead to damaging landslides. The basic lie of the land was extremely challenging with its steep sedimentary rocks, forcing the architect to place each building in a “floating” position, employing a raised platform, with floors raised above the ground to provide space for the land to absorb water and therefore able to “breathe” better. The buildings take up less than 20% of the resort area, allowing generous water absorption as villas sit perched off a slope on pillars. The walkways are made of Paras Stone from the Ayung River, each cut on site then laid piece by piece. A fresh leaf was picked from the local fern trees and individually placed on each tile, leaving a natural imprint. 88 steps from reception to the restaurant were built with Feng Shui principles in mind as these Yin Feng Shui numbers are considered to mean infinity, abundance and stability of energy; an important factor when building on a 45 degree angle. The steps are built out of volcanic ash that serves as a natural resource for construction and industry; this was sourced from local Mount Batur (1,717 m), an active volcano located in central Bali, which last erupted in 2000. The world famous and recently awarded ‘most amazing pool in the world’ by both Condé Nast Traveller and Trip Advisor, is a split-level infinity pool, designed by a specialist architect. 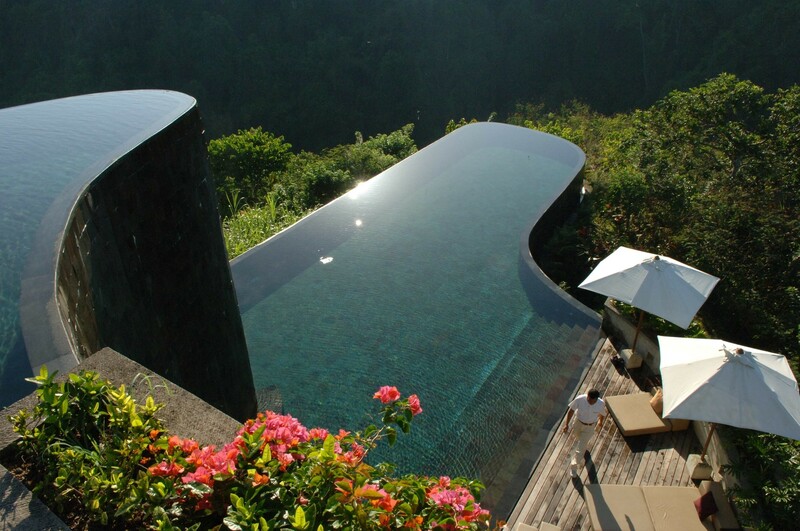 Lined with Batu Chandi slate stone and consisting of geometric walls of solidified volcanic ash, the striking bi-level pool is suspended over the dense rainforest; with an undulating shape that echoes the surrounding terrain. The resort’s garden was conceived by a landscape architect. It is planted with exotic trees and tropical shrubs such as cocoa, coffee, durian, rambutan, lychees, and a variety of tropical bamboos, fruit trees, flame trees, bird of paradise flowers and orchids. The villas were also designed with a contemporary Balinese influence and all have king-sized four-poster beds, handmade batik cotton fabrics, an interior bathroom with hand molded bath, terraces with open air showers and dramatic Java stone infinity pools with adjoining Bales (traditional Balinese relaxation areas). The designer used precious woods throughout the property, including Merbau flooring for the interiors, Benkirai for the exteriors and wooden furniture with sculpted doors in the Balinese tradition. The hotel has four categories of villa-style accommodation: 15 Riverside Deluxe Pool Villas, of approximately 100m², 15 Panoramic Deluxe Pool Villas, of approximately 100m², two Panoramic Pool Villa suites of 160m² and six 2-bedroom Duplex Family Pool Villas of 160m². One of the challenges for the owners was how the guests would move effortlessly from level to level. As a luxury hotel, there needed to be a simple effective solution. This was found in the unique feature of the Twin funiculars. They were imported from a New Zealand cable car specialist company, were customized for the resort and made from reinforced aluminum. The first funicular takes guests from reception to the bar, via four different levels, accessing private villa stations and the boutique shop and library. The second funicular takes guests from the bar down to the River Café and Spa overlooking the Ayung River. Together both funiculars, canopied by the jungle vegetation, reach eight levels. hi everyone! we are not planning to stay there but we want to know if we can pay and spend maybe 2- 3 hours in that pools? i mean, like a pool ticket or something like that. This is great place. Lush green forest surrounding hotel and make this place attraction for the travelers. I assure this is one of the best place for the travelers. Specially, services offered by hotels in Bali feel yourself that you make right decision of your life. Your pictures are very nice and look like glooming in swimming pool. Thanks for share. Beautiful photos! The hotel seems perfect or my vacation plans too. Been there and loved it! It’s incredible. Also check out http://www.nandinibali.com/ not too far from it. I stopped at Payangan for my school trip back 1990s before Economic crisis. It was small and secluded community with a lot of Bamboo forest. Those fast development surely will change landscape in there.